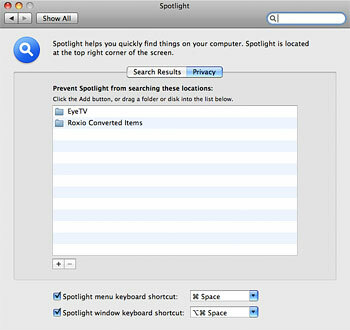 Spotlight allows you to search the files and folders on your Mac instantaneously. Like any computer database, however, it can become corrupt and inaccurate over time. No problem — it’s an easy fix. To give you an example of when Spotlight might need re-indexing, I’ll share one of my recent personal experiences. Spotlight doubles as an excellent application launcher, in addition to its more well known purpose as a search utility. One day I installed an update to Firefox and hit the keyboard shortcut for Spotlight (Command+Spacebar). Usually typing f-i-r-e will automatically bring up a shortcut for Firefox. Not this time, though. Taking a look at the Applications folder showed that Firefox was there, but Spotlight showed no trace of it. Clearly something was wrong. 1.) Open System Preferences and click the Spotlight pane. 2.) Click the Privacy tab at the top of the window. Here you will see a list of places that Spotlight has been instructed not to index. 3.) Click the plus (+) button and find your hard drive, or open a separate Finder window and drag your hard drive to the list area. 4.) After a few seconds (3-5 should be enough), select the drive in the System Preferences window and click the minus (-) button. Spotlight will begin a scan of your entire hard drive and rewrite it’s database from scratch. You may notice that your Mac becomes extremely slow during this time, which is completely normal. In fact, it might be a good idea to walk away from the computer for a while since it could take a few hours to complete. Once it’s done, your searches should be faster, more reliable, and more accurate. This doesn’t appear to work in 10.6 and I can’t find any solutions on google – any suggestions? Using Snow Leopard and Spotlight wasn’t working, at all, so I have tried both the adding and removing of hard drive from privacy as well as the terminal command. Neither worked. The terminal command came back with “no index.” I installed Google Desktop and when I go to the preferences for that, it tells me that the hard drive is on privacy and it will not index it. However, there is nothing at all listed in my privacy list under system preferences. It’s like a hidden privacy! Any ideas on how to fix this? I’ve added and removed the hard drive a number of times, waiting a while in between, restarting, and nothing fixing it. Thanks! Actually, I was mistaken, using 10.5.8, not Snow Leopard. Worked perfectly for me with snow leopard, thanks! I hope Apple stabilize this part, as it is so important to a Mac. This rocks! I’ve been having progressively worse problems with this for months and it finally became so bad I had to do something! Followed your advice and 10 minutes later it’s fixed! Thank you!!!!!! It works as long as you are searching on your hard drive, however if you are searching on a server it does not work, for some reason I was unable to add the server drive. I’m running OS X v10.6.6 on my Macbook Pro and this fix seems to work beautifully. A very simple yet effective trick. Thank you! Thanks! That worked great after all the others didn’t! I did add the drive to privacy, then, after a reboot it restarted properly.